Are you looking for roofing in East London? Need your gutter checked? Spenwell Builders offers a range of services for your roofing and guttering needs in the Essex and Greater London areas. Is your roof old and prone to insulation problems? Is every new rainy day a cause for more concern and infinite haphazard solutions? Having a safe, perfectly insulated roof is the most basic requirement to maintain the integrity of your home. A broken or deteriorated roof can lead to a number of serious problems, such as water leakage, the spread of mold, and in some cases, the roof may fall in altogether, especially if it is an older house where the support for the roof is made of wood. With our years of experience in roofing construction and repair, we can help you restore your roof to optimum functionality or help you build an entirely new roof to suit your home. If you’re looking to completely change your roof, or even build a new roof from scratch as part of a construction project, our years of expertise can aid you in handling the task from its inception right down to the finishing touches. We can help you install both slate roofs and flat roofs, according to the unique style and functionality requirements of the building that needs roofing. As part of our construction expertise, we offer all the services necessary to build sturdy and safe roofs. 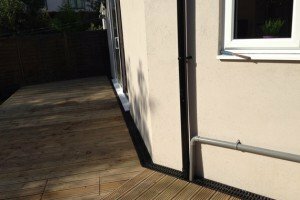 This includes a range of steps, such as pointing, waterproofing and insulation, cladding, fascias, and soffits. When a roof is having problems, it usually means that one of these components of the roof structure is deteriorating, and you need a professional to assess the damage. Don’t let your roof deteriorate without an expert’s help, it could make all the difference! For your roofing in East London, only a local expert will know just how to handle the problem. We also specialise in all guttering repair. A proper guttering system is necessary to remove excess water from a building, thus avoiding the many issues that rain water can create for a home’s insulation. If your guttering is having problems, it needs to be fixed promptly to avoid any deterioration of roofing materials, especially in the London area where rain is abundant and persistent! We are the construction company to call for all your roofing needs in the Essex and Greater London Area. If you need roofing in East London and guttering construction or repair in the Essex or Greater London areas (Romford, Dagenham, Chigwell, Woodford, Ilford, Brentwood, East London) do give us a call, and let us answer your questions and clear your doubts. With 25 years of experience working for the community, we can guide you through the construction and repair process with skill and ease. If you need a builder near you, we are the construction company you can trust.